The Christmas holiday has always been a festive time and companies like Coca Cola have always seen fit to get into the spirit of things. In doing so over the years, they have created many representations of Santa Claus, like this one found in their 1962 coke ad. Just as Santa ought to be symbolized, he is seen in this jigsaw puzzle trying out a few of the toys. Jolly as ever, it would seem that he always has cheerful spirit and a nice, cold coca-cola helps. 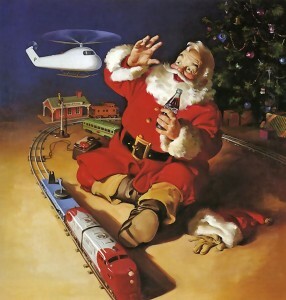 Actually, Coca Cola Company helped shape the image of Santa Claus we all share today. Credit: Special thanks to James Vaughan for making the photograph used for this jigsaw puzzle available through the Creative Commons Attribution ShareALike license. Visit James Vaughan's Flickr photostream. See all jigsaw puzzles based on James Vaughan's photographs.